I have friends that say they cook because they have to and try to get out of it as often as they can. I use cooking to get out of everything else I’m not in the mood to do. If I need to dust, vacuum, or clean out a closet I’ll start cooking instead. After all, my family needs to eat. It’s the perfect justification for putting off the more boring chores. I’ll cook pasta salads and make salad dressings to have on hand for lunches for the week. I’ll bake something or play around with new marinades for the grill. Anything so I don’t have to push the mop plus everyone benefits from a good meal. I do get around to cleaning the house, I would never let it go, I just procrastinate like a child doing homework. So with all this playing around, I have a couple of new recipes I would like to share with you. Some were inspired by dishes I tasted in restaurants and others by what I found in my pantry. I am having success with my herb garden and have been using my fresh herbs in my dressings, sauces and marinades. I have my standard favorite marinades for chicken, but wanted to try something different. When we go to Thai restaurants my husband always orders the chicken satay. 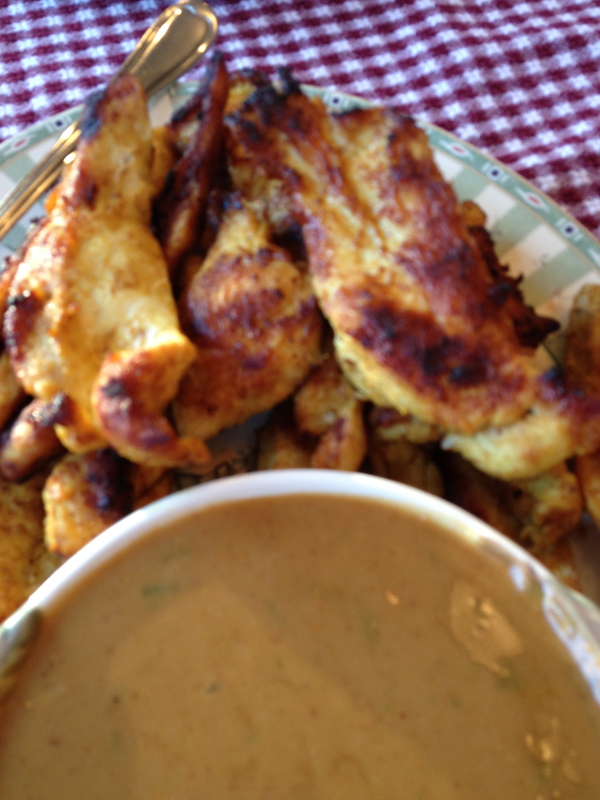 I came up with my own marinade for the satay and my family loved it. Usually peanut sauce or peanut butter is used in Thai cooking. I don’t love peanut butter, so I subbed cashew butter. It has a softer taste. Use the peanut if you prefer. This is great for dinner or as a party appetizer. Setting aside the chicken, whisk all the other ingredients together. Pour over chicken and marinate for at least four hours. For best results, marinate overnight. Before you are ready to grill, soak bamboo skewers in water for 20 minutes so they do not burn. Ribbon the marinated chicken onto the skewers and grill. Grill time will depend on your grill. Keep in mind that the chicken ribbons are thin and will cook quickly. *If you wish, set aside some unused marinade to use as a dipping sauce. Do not use any sauce that has touched the raw chicken. We were at a BBQ and the salads were all catered from a deli. My daughter liked one that had sundried tomatoes in it and asked me to try it. I thought it was pretty good but could have had more flavor. Since she liked it so much I decided to go home and play with a recipe for this pasta salad. My family loved it and I use it often for our backyard parties. I often make sundried tomatoes as an appetizer. When I do, I rehydrate them by bringing a small saucepan of water to a boil. Remove from heat and soak the dried tomatoes for 5 minutes. Drain and gently squeeze out the excess water. Dress with the oil, vinegar, salt, pepper, garlic, basil, sugar, tomato paste and liquid. The measurements are estimates. I never measure. I test and add. You can measure and make something exactly the same way and it will come out different. You must taste. After you dress the tomatoes, separate half and put in a small food processor. The mixture will look like a paste. It should be a medium to loose paste. You may need to add some additional olive oil to the food processor to get the proper consistency. In the meantime, boil the pasta. It should be al dente. Drain and rinse with cold water to cool. Mix in the paste, coating the pasta. 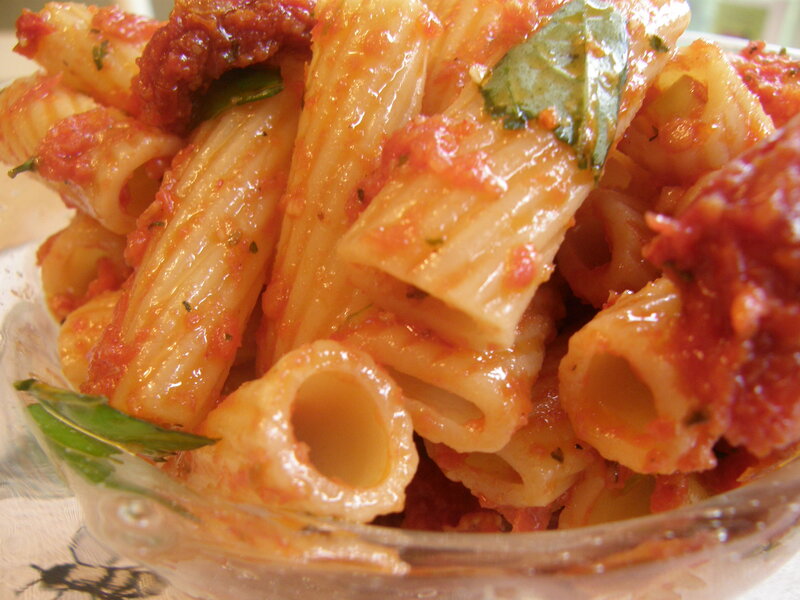 The whole sundried tomatoes should be sliced into halves or thirds and mixed into the pasta as well. The oil and herbs that dressed the tomatoes go in for flavor and moisture.